You know, it's real handy when an exclusive is a redone version of a figure we've already reviewed. The things we said at the beginning of that review are still true: NECA's Assasssin's Creed figures continue to run about one game behind. 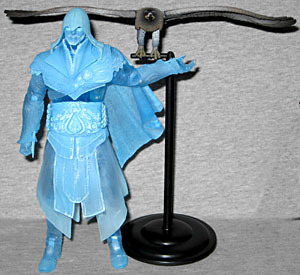 AC3 is due out this October, and as such, we're finally getting the first AC Revelations toys. But just in case you missed the addendum to that previous review, don't think this delay is something we're complaining about. As I said back then, it's a rather smart way of doing things. Before we start copying and pasting all the things you read before writing the review of this new and unique figure, there's something you must know: this figure stinks! We're not saying it's a bad toy, we're saying that upon opening the packaging, you'll notice a bad smell. It's not the most horrible, pungent toy ever released, but it's strong. And it lingers. Ezio, were you hiding in the midden heap again? Anyway, back on topic. This is "Eagle Vision" Ezio Auditore, and while I have yet to play a single second of any AssCree game, I'm just going to go out on a limb and assume it's like Detective Mode in Arkham Asylum: a special way of looking at the world that lets you tell friend from foe. And also apparently turns you blue, because all the game programmers got together at some point and agreed that blue = super-special-awesome vision. So this exclusive is all about the paint. 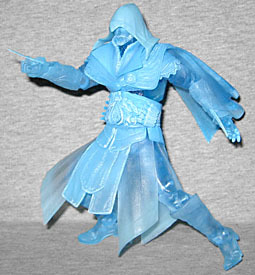 The sculpt is the same as the Legendary Assassin Ezio (right down to the 2011 date stamp hidden under his skirts), so it's just the color of this figure that sets it apart. 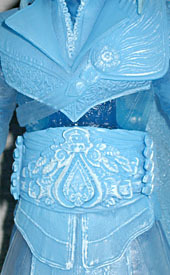 The figure is molded from a semi-translucent blue plastic. It's not translucent blue like the Lightning Gremlin, it's more of a cloudy, smoky blue. He and Sub-Zero can be pals. 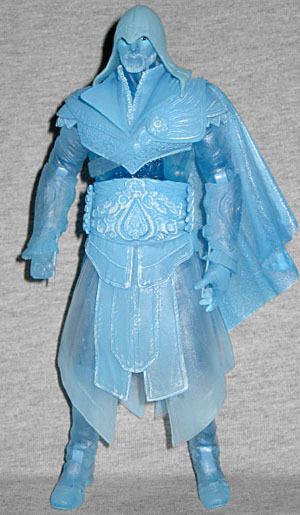 And like that Sub-Zero, Ezio gets some paint apps to keep him from just being plain (smoky) blue. In his case, it's a faint white applied to the fancy details on his belt, the armor on his left shoulder, and a few edges of his clothes. It's simple, but it looks really nice; it brings out the details that would otherwise be lost. So, the reason we can tell that this is a Revelations figure is that he's sporting a beard - facial hair being the game's way of showing the passage of time. His eyes get solid paint apps, to make them stand out: white with black pupils and outlines, plus light blue paint around the eyelids. While the rest of him is a ghost, the eyes are "real." None of the articulation that has made the current AC toys so awesome has been lost for this exclusive. He has a balljointed head, balljointed neck, lateral hinge shoulders (hidden by the shawl), swivel/hinge shoulders, swivel biceps, swivel/hinge elbows, balljointed wrists (to facilitate swapping them out, but they function more like swivels), hinged wrists, hinged torso, swivel waist, swivel/hinge hips, swivel thighs, double-hinged knees, swivel boots, hinged and rocker ankles, and hinged toes. The interiors of the joints are molded from a solid plastic - still pale blue, but definitely solid - so you don't have to worry about the weakness that clear plastic ofen has. Eagle Vision Ezio comes with the usual assortment of replacement hands, but no weapons other than the two blades hidden in his sleeves. So where did the accessory budget go? To creating the amazing eagle that gives its name to this figure. It's also the reason I decided to get this set: the blue is cool, but I wanted the bird. Did you know NECA made toy versions of Hedwig, Pigwidgeon and Crookshanks for the Harry Potter line? I didn't, and I'm pissed I missed them. (Hey NECA, got any extras lying around?) There was no way I was going to miss this birdie. The bird is a Golden Eagle, which can be found all over the Northern Hemisphere - including Italy, naturally enough. 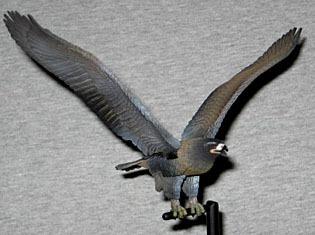 It has a 7⅞" wingspan, a highly detailed sculpt and truly impressive paint. The only articulation points are hinges for the wings, but how much more do we need? Because NECA put more thought into this eagle than Mattel put into theirs, he comes with a 5¾" tall stand so that he doesn't have to be propped in the corner of your display. It's just a disc base with a long stand and an arm sticking out the side, with two pegs to fit into his feet. If this exclusive were just Baby Blue Ezio, he would have been interesting, but not a must-have: the inclusion of his totem animal is what pushed him over the top. 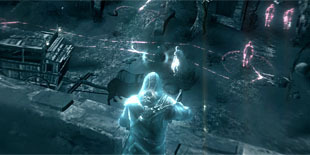 We've had this Ezio before (mostly), but not the cool eagle - and we're unlikely to get it again. So when was the last time you thanked someone for giving you the bird?